Consisting of fat beneath the skin, cellulite will appear uneven because it is pressed up against connective tissue, resulting in bumpy looking skin. It is harmless and is not indicative of obesity, but some individuals may opt to treat it due to its unsightliness. The presence of cellulite may be hereditary, but it may also be caused by an imbalanced diet, a slow metabolism or dehydration. Most people develop cellulite at some point in their lives, and this is not easy to treat as it requires a lot of time and discipline using typical techniques. 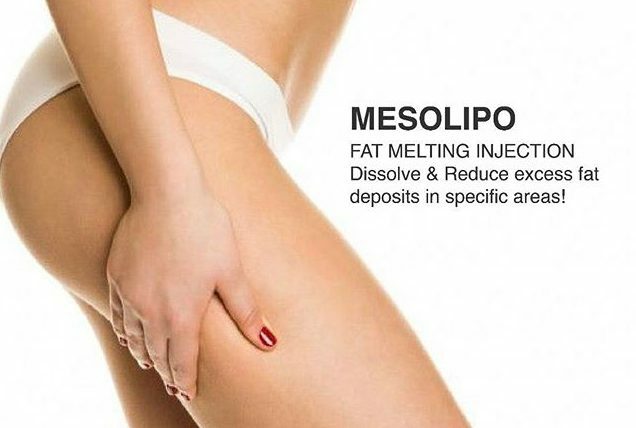 Using the mesotherapy technique, the MesoLipo fat melting injection specifically targets deposits of localised fat and cellulite, and is less invasive than liposuction. The substances that are injected slowly dissolves these fat deposits and cellulite, after which the body’s natural processes will eliminate the residue over the next few weeks. After an initial consultation, the MesoLipo fat melting injection can be performed during quick visits, helping to reduce cellulite without the need for extensive surgical methods. The injections comprise of a mixture of a natural soy bean lecithin and enzymes which can break down stubborn fat deposits that resist the efforts of dieting and exercise. WHY SHOULD YOU CHOOSE MESOLIPO? In the last decade, doctors around the globe have successfully incorporated mesotherapy techniques on many patients. Non-medical spas and other practitioners without experience have struggled with this treatment; it is very important that you seek out a professional doctor from an established clinic to ensure you remain safe and minimise any risk of undesirable outcomes. Within a proper clinical setting, this is a very useful method to help reduce the amount of cellulite and localised fat, with results likely to be visible after 4 or more treatments. The procedure is swift, and any side effects you may have are minor and temporary, such as soreness, bruising and swelling.